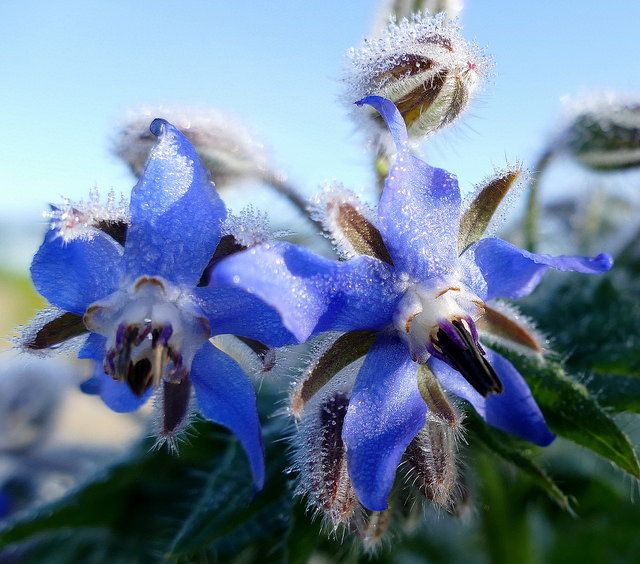 Ornamental and edible, the vintage cottage star flower called "Borage" is eye pleasing, culinary, medicinal and essential food for the bees that enter the garden. Here in Australia, Borage grows throughout the year, even tolerating light frosts. While it's an annual plant, it regularly sets seed and new blooms appear during all seasons. 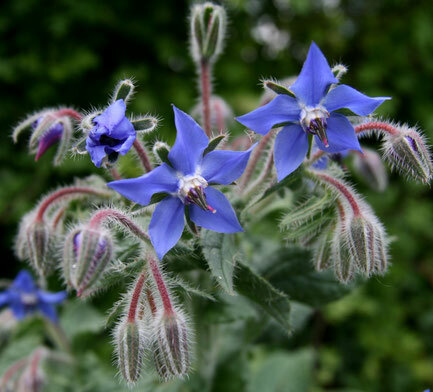 Easily one of my absolute favourite plants, Borage is so adaptable that it can be grown in your vegetable patch, with other ornamentals to attract butterflies, in the herb garden, and in the winter flower garden to feed the bees. 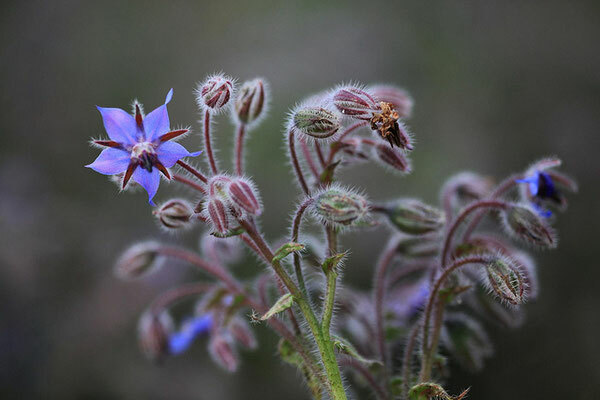 Borago officinalis grows into a tall bush, producing sprays of a brilliant blue star shaped flower, it drops a large black seed from its middle once the flower fades to a purple pink colour. 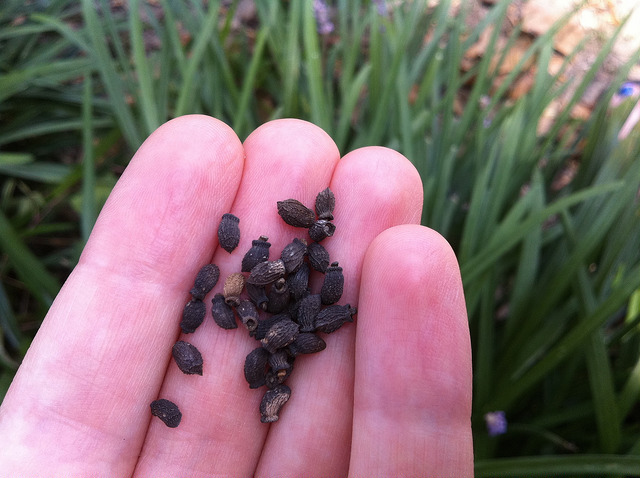 These large seeds ensure its easy to plant and re-seed. It is not fussy about where it is planted, as long as the soil is free draining, it doesn't like wet feet. 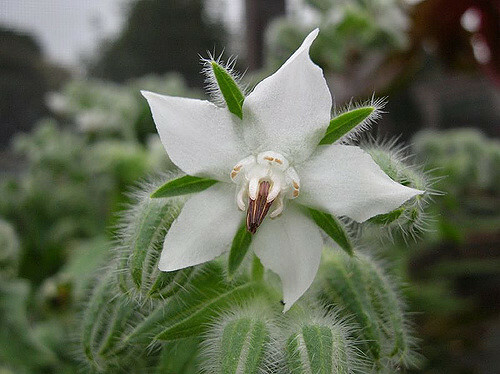 There is also a lesser known white borage flower called "Alba", if you can find seeds give them a try. 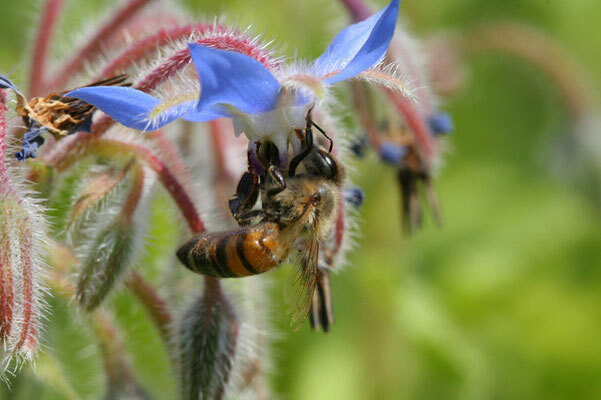 In the days of our grandparents Borage was nicknamed "Bees Bush" or "Bees Bread" as it has a high pollen content. With the bees attracted to it's honey smell and bright blue flowers, it is a valuable addition to the winter garden. 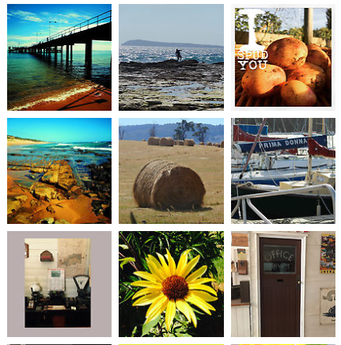 Bees still go out to forage once the temperature is over 10 degrees celsius. It's cucumber flavoured leaves are not just good for us and the bees. The chickens love the extra greens in the winter and gobble up the leaves, stalks and flowers. 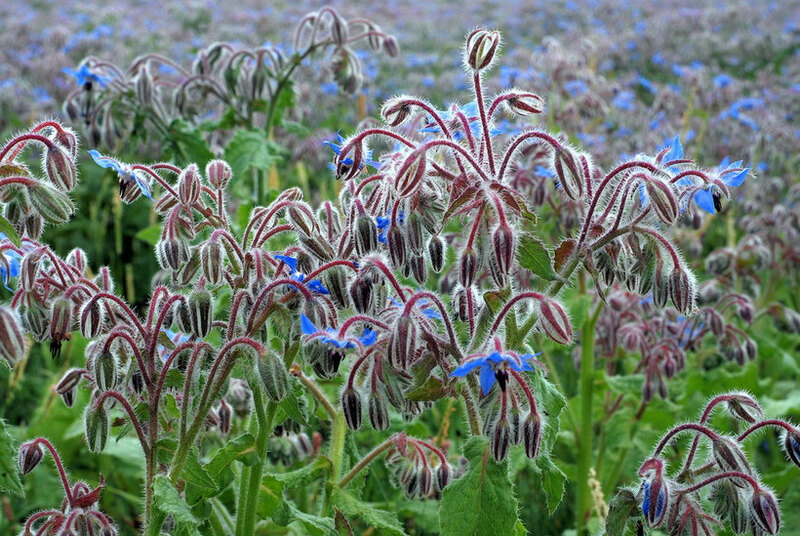 Borage is a friend to the garden, it repels pests such as hornworms, attracting pollinators, and aids any plants it is interplanted with by increasing resistance to pests and disease. 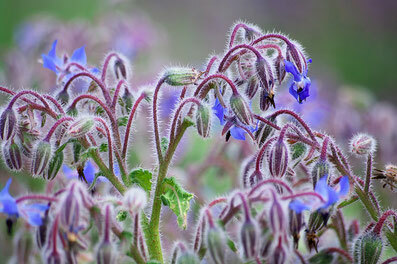 Companion plant Borage with tomatoes, strawberries and pumpkins, cucumbers and zucchinis. 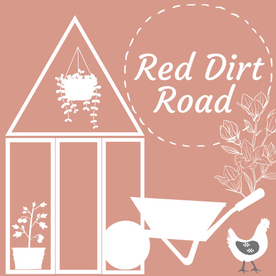 It adds trace minerals to the soil it is planted in, and is good for composting and mulching. While they do grow tall and can colonise in the garden, the plants are easy to identify and can be pulled out very easily. We have found no problems transplanting them into other spots of the garden, but success depends on soil vigour and its advised to grow from seed in a new patch. 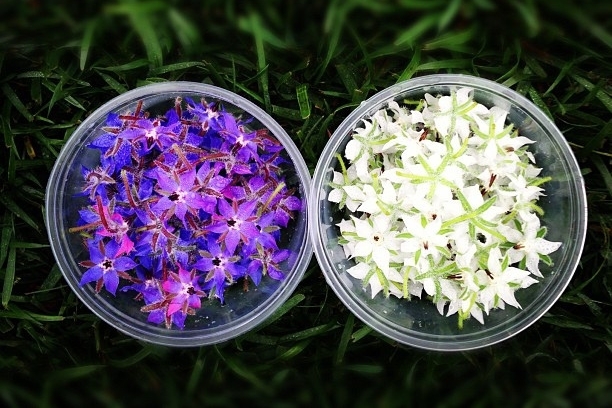 Borage provides that summery cucumber flavour in the winter, and while its readily known that you can decorate salads and cakes with the flowers and add them to ice cubes, there is so much more to the plant than just this. The young leaves can be added to green smoothies for instance. 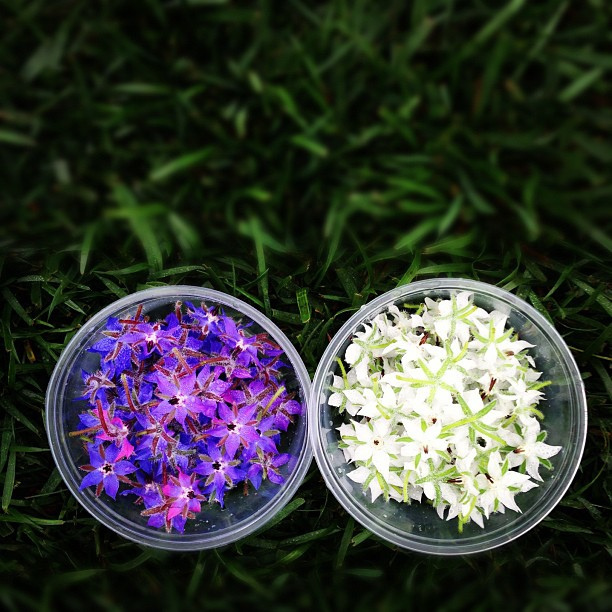 Specifically, borage has very high levels of GLA, gamma linolenic acid, an important essential fatty acid. 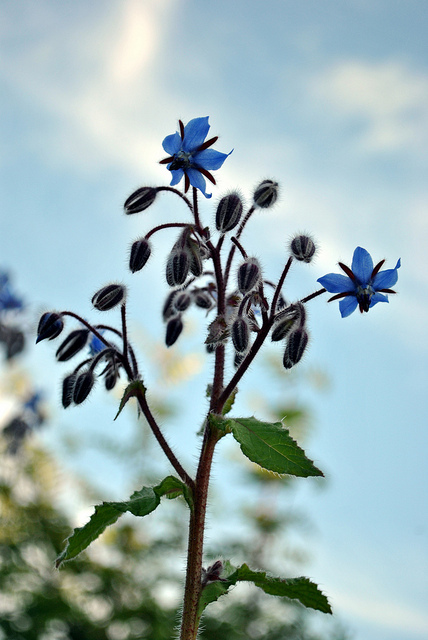 Borage is also packed with other healthy nutrients that are great for the body. Borage is a good herbal supplement for women because it contains high levels of calcium and iron. 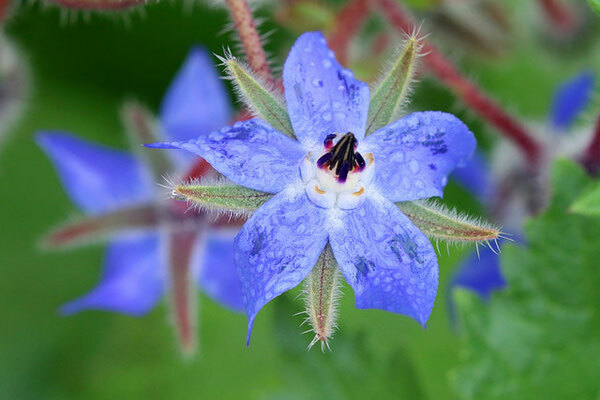 Potassium, Zinc, B and C vitamins, and beta carotene are packed into the borage plant making it very nutritional. 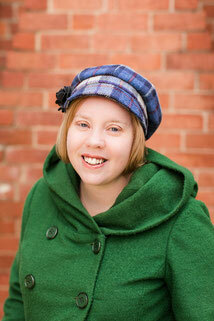 It is also anti-inflammatory and a natural sedative, repairing the body and calming the mind. It's leaves can be stewed in hot water to make a tea. Add it to your bath in a salt scrub or into potpourri. 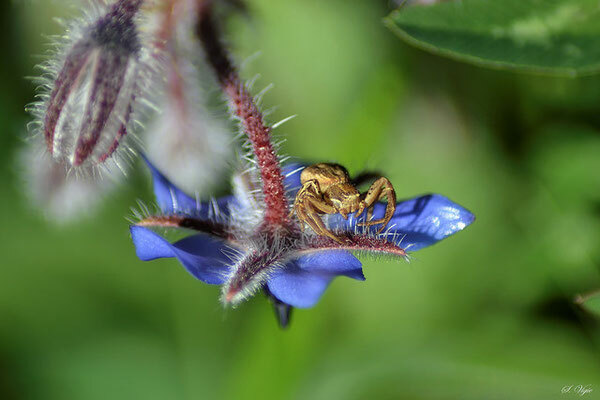 Whether feeding yourself, or feeding the bees, try this Mediterranean beauty and enjoy the benefits it can bring to the garden and to your life.